I am told you can find some guest houses that have dorms around the West End where the dive shops are, but that they don’t have websites. I didn’t find anything about one online. I did see a sign for a hostel when I went to the West End while on the sailboat but I didn’t see any place that looked like it was the hostel. 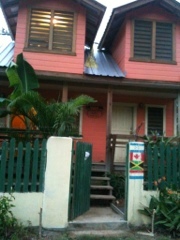 Looking online, I found a listing with reviews and a website for Roatan Backpacker’s Hostel and decided to go there. The reviews said Mel, the owner, was very nice and helpful. This is true. She gave me plenty of information about this area — how to walk down to the beach, where to eat — and also answered every question I had for my articles about Roatan. 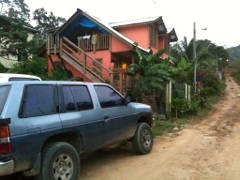 It is a small two story building on a dirt road. It is easy to walk from where the bus drops you off on the main road. You just ask to be let off at Roland Hardware which is on the land side of the road. I stayed in one dorm with 3 bunk beds and a private bathroom that has a HOT shower! There is a second dorm. There’s a kitchen. There are also private rooms upstairs. Sheets are provided if you don’t have one, for a small fee. There is a backyard, back patio — and a small built-in (below ground) swimming pool. There is also Wi-Fi and the signal at the pool is strong. (The signal in the downstairs dorm and front porch is not strong as I write this.) there is. Small common room upstairs and clothes lines in back. Oh, and Mel does your laundry for you for a small fee. There is just one thing I wish the hostel had: a screened in porch so I could avoid Mosquitos as I had the great conversations with guests and Mel out on the front porch. Mel is doing a lot with the property at this very moment so you may have that porch and more when you arrive. Because it is on a jungle road, I got a few new mosquito bites in the evening and through the night, even with the excellent screens and ceiling fan. I always get bitten though. Another great thing to know: there is an excellent medical clinic extremely close by.